Chapter One: “Walking With Blaine” here. The Alaskan Way Viaduct, or the I-99 Viaduct or, more simply, The Viaduct, is an elevated north/south expressway situated right on the waterfront of Elliott Bay. It was, like literally every other half-assed and poorly-planned transportation “solution” Seattle has ever conceived: an utter failure in many, many ways. It was terribly-proportioned, its hulking mass contrasting with surprisingly few and narrow lanes. As a way to get from point A to point B, it barely worked from day one. When it was designed in the 1940s, you could still buy Studebakers new. So from that perspective, a double-decked roadway with only two lanes made perfect sense. Speed limit? 40 mph. And besides, how fast do you want to go. And herein lies the problem with this, and pretty much every other transportation “solution” Seattle has ever come up with. They are designed to solve the problems the city has right now. How will this “solution” be used in the future? So, fast forward to the year 2000 and what do we have? An aging, double-decked roadway with three lanes now crammed on each level and speeds raised by nearly 50 percent. More people, more cars, less time to get things done, and the same tool we’ve been using since Truman was President. Seattle is obsessed with this stuff. They always have been. From the beginning, Seattle has been derided as a provincial backwater town whose main contribution to American society was supplying gear to Yukon gold miners and popularizing salmon as a dinner option. And from the beginning, Seattle has had a chip on its shoulder, thirsty for recognition, begging to be considered one of the big kids on the west coast. From its inception, Seattle acted like it was just a matter of time before people realized that San Francisco doesn’t offer a tenth of what Seattle does, that Denver will never be what Seattle is, that young, up-and-comer Los Angeles is just a flash in the pan, Portland is just a pale imitation of the real Northwest city, Seattle. The Alaskan Way Viaduct was an elevated freeway in Seattle that supported State Route 99. 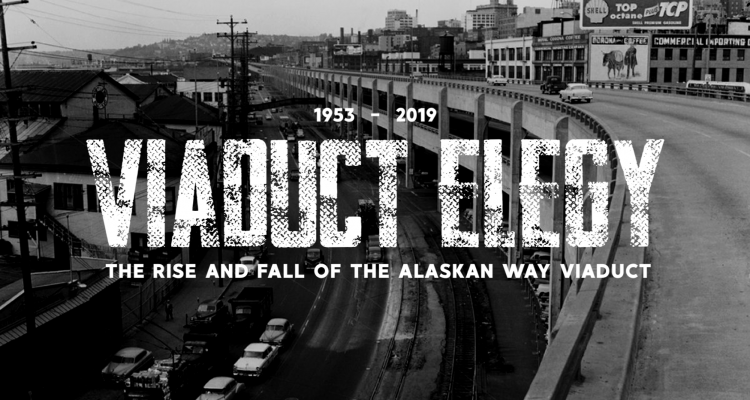 The double-deck freeway ran north and south, along the city’s waterfront for 2.2 miles, east of Alaskan Way and Elliott Bay, and between the West Seattle Freeway in SoDo and the Battery Street Tunnel in Belltown. 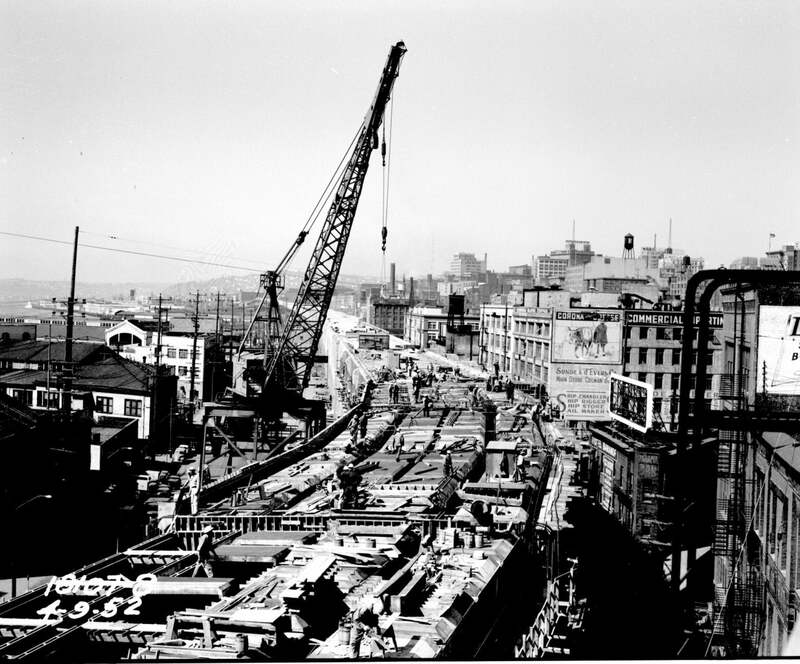 Construction consisted of three phases from 1949 through 1959, with the first section opening on April 4th, 1953. Photo: Seattle Municipal Archives. And every time any city west of The Rockies would do something; every time San Francisco would host a big worldwide event, or Los Angeles would grow and grow, or something along those lines, Seattle would grumble and huff and puff and get just a little more surly and gray. Again we would be outshone by another western city. Again they would steal the spotlight. And Again people would be fascinated by San Francisco or Los Angeles or wherever when they should be dazzled by Seattle! It was a shame that people could be so stupid and overlook us, but that’s okay. It’s their loss, not ours. We’re the cool ones. Really! You’ll see. Seattle is the proverbial third-cutest cheerleader. We try real hard and we yell and jump and shake our pom-poms just as good as the other girls, but for some reason we just don’t get asked to the barn dance by the star quarterback. It’s confusing. mysterious. unfathomable. It’s annoying as all get out. Anti-viaduct bumper sticker, circa 2006. From the folder “Bumper Stickers,” Ephemera Collection (Record Series 9900-01), Seattle Municipal Archives. Right after the Second World War, that answer was The Alaskan Way Viaduct. Seattle was, by local standards, humming after World War II. Boeing was going great guns. No longer were we just a fishing and logging town stuck in the upper left-hand corner of the map. Nope. You’ll see. Seattle is gonna be it, baby. Take that Scranton! And how did we know this? The Viaduct. New. Clean. Modern. This will be the way to get North and South in smooth, concrete efficiency. Four lanes! That’ll show those hoity-toity types in San Francisco and Chicago just how cool Seattle is. You bet’cha! And so, the city built this monstrosity as the way to move around. Built partially underground to the north in the Battery Street Tunnel, then rising up to the double decks of The Viaduct proper, it was a marvel of American ingenuity and post-war know-how. Nearly two miles long, it took from 1949 to 1959 to build the entire thing. But hey, would you look at that, it got done just in time for the Seattle World’s Fair in 1962! See? Planning! You could drive up the viaduct and it would deposit you right on the grounds of World’s Fair. How convenient! Shortly thereafter, various groups started proposing tearing the thing down . . .
Viaduct Elegy: Chapter Three: Streamlined Brutale here. Follow Tony Borroz on Twitter: @TonyBorroz. For more historic photos of the Alaskan Way Viaduct and the city of Seattle, visit the Seattle Municipal Archive’s Flickr page. No Comments on "Viaduct Elegy: Chapter 2: The New Colossus"